So one of my friends wanted us to listen to this album in the car, and it turns out I’ve been listening to and loving several of the songs on this album without realizing that it was Twenty One Pilots. This whole album is great! I quit Tsum Tsum about two years ago when I got a new phone. I had such an addiction through college, I just needed to stop. So I did. And then someone shared a screenshot of their favorite apps, and there was Tsum Tsum with Kingdom Hearts tsums. I had to go back. I mean, I don’t get to play KHIII yet because I don’t have a PS4 or Xbox, so I needed something! And it turns out I came back the same day the KH tsums were leaving. 😦 Now I can’t decide if I should re-delete it or not (so I probably should). I spend quite a bit of time playing. Okay, so I haven’t had the chance to try the Impossible Burger. Of course I’ve been hearing about it, but ugggh J & J making it woooooorse. I want to try it so bad! I have had the Beyond Meat burger at Fridays (twice now, it was my choice for my birthday dinner with friends!) and it is so good (plus Fridays has surprisingly good and inexpensive drinks 😉 )! I am so excited about so many good vegan foods coming out these past few years, and I so agree with Jenna, we are getting so freaking spoiled! 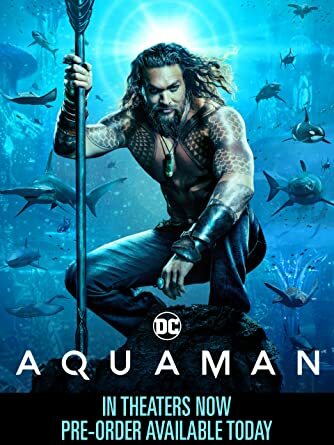 I saw Aquaman with my friends, and boy did it not disappoint! I think Jason Momoa was shirtless for at least half the movie. 🙂 And there was a momentary reference to Khal Drogo. I think it’s about to leave theaters, but if you haven’t seen it yet and you have the time to, I recommend it! What have you been doing this week, other than reading? Thanks! Haha, paying for all of my own stuff is just part of adulting I have to get used to.